Adult dogs don't appear as into it. A new study suggests that puppies are more responsive to "baby talk" than neutral speech. If anyone has ever mocked you for speaking to puppies in the way people typically talk to human babies, tell them to shove it, because those puppies are loving it. OK, loving it might be an overstatement, but a new study does suggest that puppies are more responsive to baby talk than to the kind of human speech you’d use with adult humans. Research published Wednesday in the biology journal Proceedings of the Royal Society B contains some interesting findings about how people tend to talk to dogs, and how dogs of different age groups respond to different modes of human speech. Here’s what the scientists did. First, they gave people photos of puppies, adult dogs, and visibly old dogs, and recorded them looking at each picture and reciting the words, “Hi! Hello cutie! Who’s a good boy? Come here! Good boy! Yes! Come here sweetie pie! What a good boy!” Researchers also had the test subjects recite the phrases while looking at photos of adult humans, as a control measure. Not filling this article with photos of puppies would just be plain wrong. They found that when talking to dogs of any age, people used a higher tone of voice, and varied their pitch more than they did when addressing the photo of a human adult. The humans used this mode of speech with images of dogs of all ages, though it was slightly more pronounced with puppies. The humans’ pitch went up by an average of 21 percent with puppies, 13 percent with old dogs, and 11 percent with adult dogs. They found that puppies were more responsive — meaning they were “reacting more quickly, looking more often at the loudspeaker and approaching it closer and for longer periods” — when they heard people speaking in puppy-voices or adult-dog voices, as compared with the neutral adult human voice. The researchers noted that the puppies were not significantly more responsive to the puppy-voice than they were to the dog-voice. Adult dogs, on the other hand, reacted pretty much the same way to voices meant for dogs and voices meant for humans. It’s unclear whether the researchers played the puppy-specific voices for the adult dogs. Go ahead. Talk to this puppy. The researchers noted that their findings have interesting implications not just for puppies, but also regarding human speech. “By showing that human speakers employ dog-directed speech to communicate with dogs of all ages, this study suggests that this particular register of speech is used to engage interaction with a non-speaking, rather than just a juvenile listener,” they wrote. However, it seems a little dubious to suggest that humans would use baby talk to address all nonspeaking creatures, especially ones that are decidedly not cute. 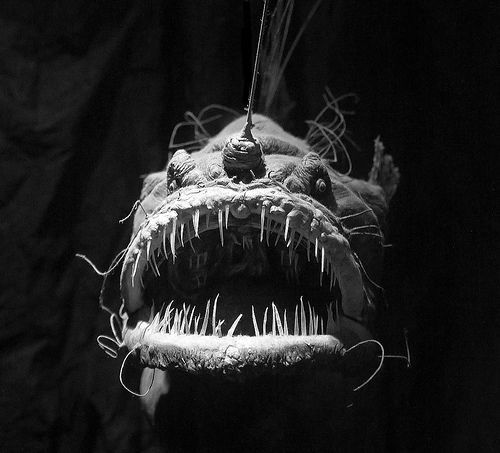 It’s difficult to imagine, for instance, people using a high-pitched cutesy voice to address, say, an anglerfish. Regardless, we’ll be baby-talking to every puppy we see from now on.